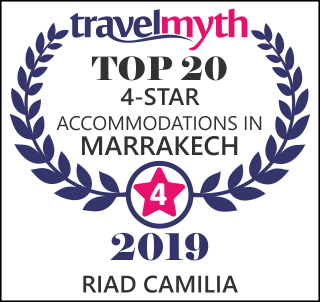 The policy implemented by the company MPG CASA HOSPITALITY which manages the Riad Camilia is effective from 18 March 2019. The information collected is used to improve the quality of the services offered by Riad Camilia and to reach its customers in all the circumstances of their stay at Riad Camilia. Access to your information is protected. MPG CASA HOSPITALITY undertakes not to disclose to third parties without your consent, the collected data and to protect them in all circumstances. The security of your information is a priority. Special procedures are put in place to protect and secure information collected online but also in Offline and informal situations. A cookie is a file placed on the hard drive of your computer, exclusively with your prior consent. Once activated by the user of the website of Riad Camilia, this file / cookie allows a better analysis of the web traffic or allows us to know which parts of the website is the most visited. Cookies allow web applications to get to know you better and to customize our response. Each customer has the opportunity to limit the collection and use of his personal data. As part of the filling of our form accessible on the website of Riad Camilia, each user can click on the box allowing his personal data to be neither collected nor used. MPG CASA HOSPITALITY undertakes not to sell, distribute or rent the collected data without the consent of its client / user. Nevertheless, we may use your personal information to send you promotional information about Riad Camilia or third parties that we think may be of interest to you. Any customer / user has the right to ask the company MPG CASA HOSPITALITY for details on the use of personal data collected under the 1998 law on the protection of personal data. Name: Limited Liability Company with a capital of 10,000 DHS. Trade Registry 94401. The validity period of this consent is 12 months maximum. Some cookies are however exempt from the collection of this consent.